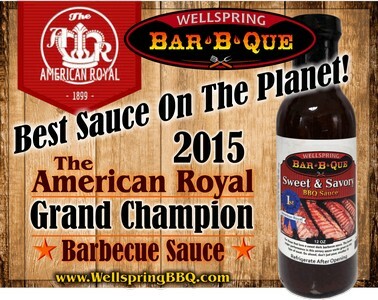 At the very first taste test of this sauce we knew we had something great, but actually winning 1st place in the 2015 American Royal “The Best Sauce On The Planet” has us feeling like royalty! Placing first in the Mild Tomato category was phenomonal. Winning the overall prize against 390 entries from 38 states and Japan, is a little humbling, seeing the competition that you are stacked up against making the victory all the sweeter! Norman Yoder, the owner of Wellspring Bar-B-Que extends his thanks to the American Royal Association and all the competitors that help make this a great event! …and of course, Check Out Our Sauce!